"I do not believe, nor have I ever stated, publicly or privately, that Israel is an apartheid state," says Kerry amid backlash. U.S. Secretary of State John Kerry on Monday expressed his regret for saying that Israel would become "an apartheid state" if talks failed. “I will not allow my commitment to Israel to be questioned by anyone, particularly for partisan, political purposes, so I want to be crystal clear about what I believe and what I don’t believe,” said Kerry in a statement entitled “On Support for Israel” which was posted to the State Department website. “Israel is a vibrant democracy and I do not believe, nor have I ever stated, publicly or privately, that Israel is an apartheid state or that it intends to become one. Anyone who knows anything about me knows that without a shred of doubt,” he added. “I have been around long enough to also know the power of words to create a misimpression, even when unintentional, and if I could rewind the tape, I would have chosen a different word to describe my firm belief that the only way in the long term to have a Jewish state and two nations and two peoples living side by side in peace and security is through a two state solution,” said Kerry. “In the long term, a unitary, binational state cannot be the democratic Jewish state that Israel deserves or the prosperous state with full rights that the Palestinian people deserve. That’s what I said, and it’s also what Prime Minister Netanyahu has said,” he added. The statement follows a wave of backlash against the top diplomat, after The Daily Beast published comments from a meeting on Friday, in which he warned that Israel will become an "apartheid state" if a peace agreement is not reached with the Palestinian Authority (PA). 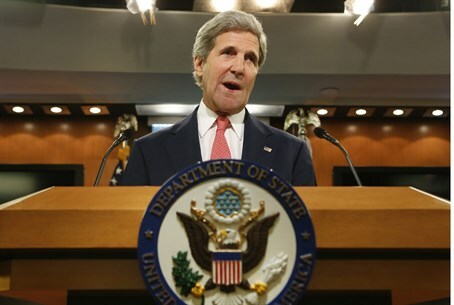 Kerry was criticized for his comments by Transportation Minister Yisrael Katz and by Dani Dayan, Chief Foreign Envoy of the Council of Judea and Samaria. Kerry’s spokeswoman, Jen Psaki, was unhelpful on Monday in trying to clarify Kerry’s remarks.